– provides approximately 1000 people/month with eye tests and glasses. 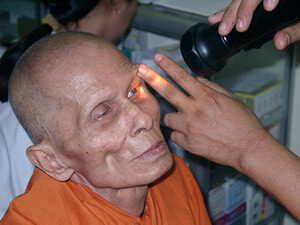 This clinic is the largest free eye clinic in Cambodia and is open to everyone. It is run by a skilled Cambodian team led by Dr. Hang Vra and is supported by visiting experts from new Zealand, Canada and Nepal. This enables the clinic to maintain high levels of expertise and service on a very small budget. The total cost of the clinic is approximately $USD3000/month. During your stay with PPSC, you are able to request a one week visit to this Eye Clinic. For many Cambodians, healthcare is largely unavailable. When a person is blind in Cambodia, the whole family suffers. A blind man cannot work, his wife has to limit her work to stay home and look after him. A child is taken from school to act as his guide. The loss of income puts the extended family into poverty. With a simple cataract surgery, the family is restored. With more funding, Rose Eye Clinic could easily double the number of surgeries a year as there is a long waiting list of blind people who could have their sight restored with simple surgery. A cataract operation costs only $USD25 to perform.